You are here: Home » PRESS » Blog » These boots are made for walking! Looking for an opportunity to dust off those hiking boots? Well look no further! We are delighted to launch our 1st walking weekend of the year this April. Kerry is a walker’s paradise at any time of the year and we take every opportunity to show it off! 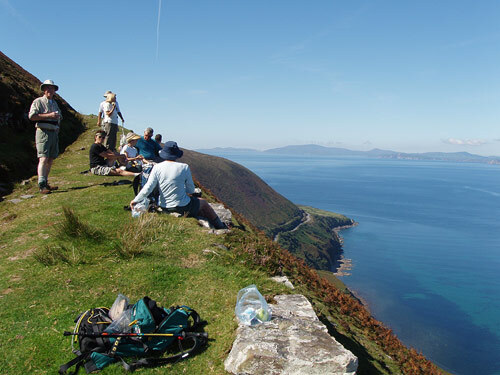 This Kerry Way guided walking weekend will showcase 2 of the most popular legs of the long distance walking trail that is the Kerry Way. Many have experienced the beauty of the Ring of Kerry by car however this weekend gives us the chance to explore part of this stunning section of the country by foot with the added benefit of a fun group and local knowledge. Our local guides will share their inside knowledge on the trail, its folklore, flora and fauna giving you a unique insight into this slice of the Wild Atlantic Way. In addition to these walks you will stay in Glenbeigh’s Kerry Ocean Lodge guesthouse where you will enjoy 2 nights’ accommodation and a hearty full Irish before heading out on the hills. Enjoy picnic lunches with some of our 4 legged friends in some of the most unique and spectacular rest stops along the way! If that’s not enough evening meals are also included on both evenings in Glenbeigh’s local restaurants! Whether you are new to walking or an old hand at it this weekend caters for the both the novice and the experienced walker in one fun group. We can’t think of a better way to spend the weekend so book today! We look forward to seeing you. Pancake Tuesday- how do you eat yours? And before we know it, 2018 has arrived! Happy New Year!!! To postcard or not to postcard? Join our mailing list to receive the latest news and updates from Go Visit Ireland.